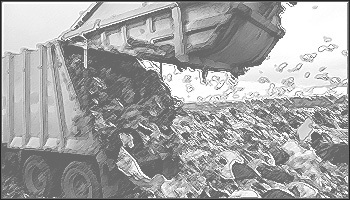 Eidyia offers a multi-faceted program for Commercial Waste Facilities. It is actually a combination of several distinct programs that can be tailored to meet the requirements of about any site/operation. Hazardous Waste sites are not eligible under our standard program but may be considered individually. Coverage is available with or without Pollution Liability. All coverage's are exclusively on a claims made basis. • Pricing is very competitive, and the policy is very flexible and may be constructed to meet most requirements. • Defense expenses are in addition to the limit of liability. On the combined General Liability/Pollution policy form the defense expenses are subject to a supplementary limit, when GL only is purchase there is no limitations of defense expense. • Pollution liability coverage is available. • Can add municipalities as additional insured's or named insured's when the facility has a contract operator. • Can include coverage for companion recycling facilities. • Pollution liability coverage does not pick up damages to the insured's own property. Only damages suffered by third parties are covered. Waste Water Treatment and Incineration Facilities are also insurable but require a Special Application. Contact us for a detailed explanation.